Satara region - a region replete with some amazing and varied forts has always been a region beckoning many trekkers. I really have some fond memories of trekking in this region - be it trekking on Vasota fort tucked away in the dense forest of Koyna Wildlife Sanctuary or spending a freezing night on Rohida fort in the month of May or confrontation with wild monkeys on Vandan fort or hiking on breathtaking Kenjalgad fort. Rainy season and throng of monsoon tourists in Lonavala made me automatically eliminate the option of visiting forts near Lonavala. 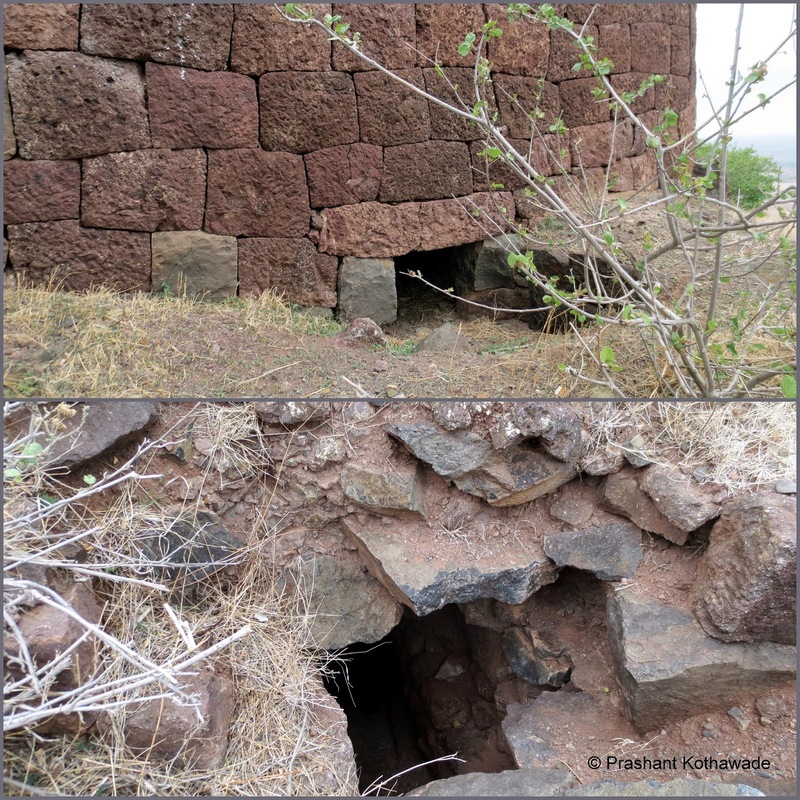 So visiting forts in Satara region seemed a wise choice. This time, I was aiming for either "Santoshgad-Varugad" or "Vardhangad-Mahimangad" which are a part of Mhasoba Range of Sahyadri mountains. Finally I zeroed on "Santoshgad-Varugad" after discussing with Onkar Oak, a dear friend and veteran of 200+ forts. With a few whatsapp messages, a group of five was formed in the form of "Sameer Kadam", "Swapnil Kamthe", "Chinmay Kirtane" and "Rishi Kasne" with whom I had trekked on Kalavantin Pinnacle earlier. Sus Road, Katraj, Kondhava, Bopdeo Ghat, Saswad, Jejuri, Lonand, Phaltan was our route. Sameer ,Swapnil and Chinmay reached to my place around 6 in the morning and we picked up Rishi at Kondhava and started our journey in my car via Bopdeo Ghat. Driving through the Bopdeo Ghat was a sheer pleasure. Winding curves combined with steep ascent along with great scenery and a very sparse traffic to negotiate provided truly great driving experience. Visit to this Ghat in monsoon could be a single activity that can bring you so much of a joy. Soon, we reached to Saswad via Swapnil's village. While passing through Swapnil's village, we teased Swapnil why he hadn't arranged breakfast at his place. 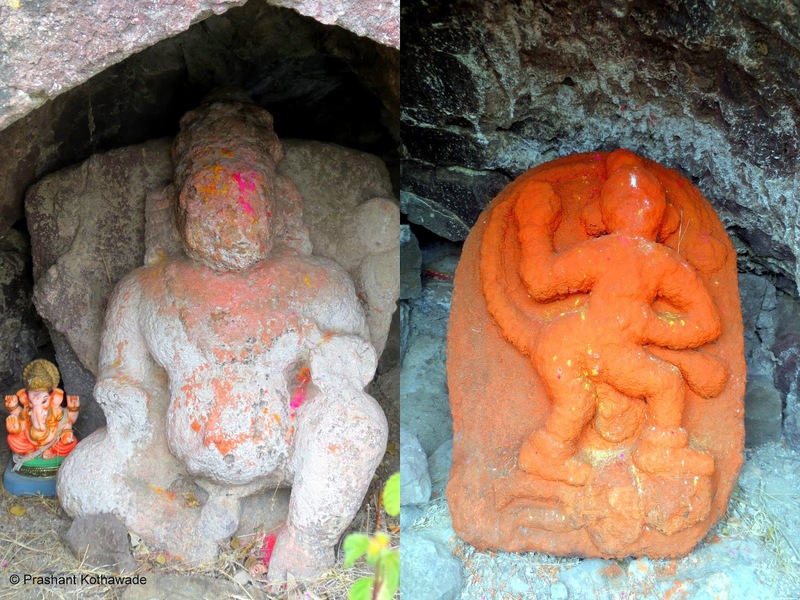 We proceeded via Jejuri, Lonand way and finally took a left turn for Phaltan. Road to Phaltan was remarkably well maintained and we didn't take much time to cover the distance till Phaltan. Our first halt was at Phaltan for breakfast. We wanted to enquire about the route to Tathavada, the base village of Santoshgad and we started our discussion with waiter. "How do we go to Tathavada?" Saying this the waiter moved away. What followed is hardly anybody's guess! All the tiredness swept away under the peals of laughter. After moving out of the restaurant, we confirmed the direction for Tathavade village and proceeded towards it. Road to reach Tathavade village was narrow but well-maintained and soon we reached to the base village located around 20 kms from Phaltan. A joy surged through us when we had a clear view of Santoshgad , standing proudly since many centuries.This fort is said to be built by great Marathi King, Chatrapati Shivaji Maharaj. We parked our car in front of a villager’s house and started our hike. Man Taluka in Satara District is one of the areas where it hardly rains and drought is the perennial problem villagers living in this area face. But as we were hiking in this region for the first time, we did not take any chance and were well prepared for the rains. But as we got out of car, sun had already become warmer and baking the earth and there was hardly any sign of rain. After applying the sunscreen lotion and wearing caps, we started our hike. Hiking trail is distinct and there are many boards with pictures of animals and birds that guide you to the top of the fort. Soon, you come across a diversion from where you need to go to right to reach to the base of the citadel. Along the way, you come across the remnants of the entrance gates. As we were hiking, suddenly the weather became overcast and it started raining. It proved to be a passing shower only and soon the weather cleared and sun again started shining. We spent few quite moments at the base of citadel from where whole barren landscape was adding to the ruggedness of the mighty Sahyadri. Soon, we reached on top of the citadel and started exploring the fort with the help of book “Gadkot” by Bhagwan Chile and TrekShitiz’s recently published book of maps. On the Southern side, there is a big water tank not easily visible as it is almost covered by the branches of a tree. It was a totally dry water tank and we went inside of it using the steps. Height of the tank, roots of the banyan tree clinging to the walls and canopy of branches covering the tank from the top made the place looked like very secluded and haunting. As it was utterly silent and peaceful, we spent quite a some time before coming out of it.This place is something very different and unique about this fort. Fortification of the fort is still very much intact. There are many secret routes and caves on the fort. Soon after exploring the citadel, we descended to the base of the citadel on Eastern side from where the whole length of the citadel was looking very inviting. Only disturbing part was that even this fort was not spared by the insane graffiti. There were few rock patches with good grooves at the base of the citadel and Rishi tried to climb those for a certain height. On the South-East side, rugged views of the mountains added to the parchedness of the entire region. Soon, we descended to the area where a small math (monastery) and temple are located. Entry to the math is restricted. We rested for a while around the temple. As we were carrying the packed lunch, we had the option of taking a lunch break but as nobody was hungry yet, we decided to descend to the base. Few kids were playing and we had a hearty laugh while talking to them. Kid on the left side in the below picture seemed very naughty and wanted to get clicked very separately and flashed a million dollar smile. Soon we reached to the house where we had parked our car. After thanking the family residing in the house, we proceeded towards the beautiful "BalSiddhanath" Temple. Caretaker of the temple was cleaning the premises of the temple and temple was closed for visitors. We tried our luck and requested caretaker to open the temple and he readily obliged. After spending few quiet moments in the temple, there was a feeling of contentment. After confirming the direction for Varugad, our next destination, we bid adieu to Santoshgad taking away the sweet memories of it. 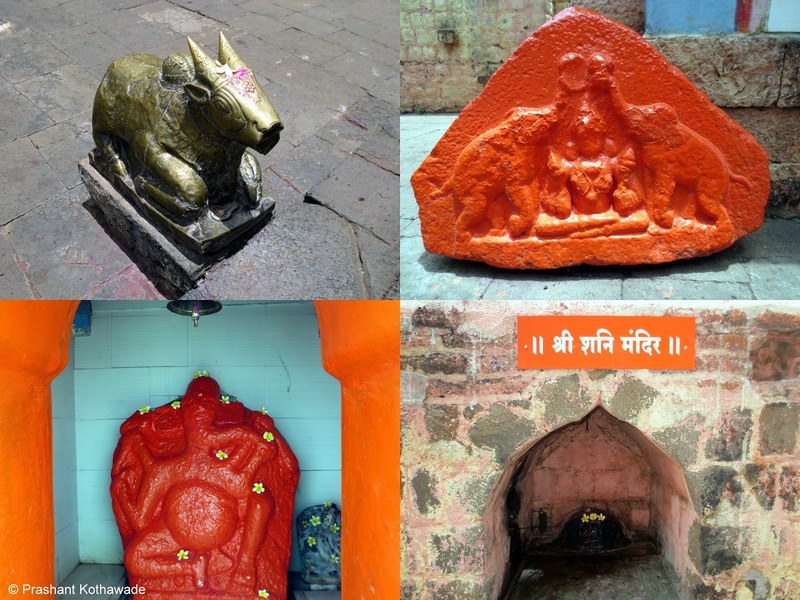 Each fort provides something unique and Santoshgad was no different. Getting enchanted by rugged landscapes as seen from top of the fort, "Mahadev" temple located inside a very unique water tank, a beautiful "BalSiddhanath" temple at the footsteps of the fort truly provided ineffable sense of joy and satisfaction. Santoshgad fort, situated in Sahyadri's Mhasoba Mountain Range is rich with fortification and a good place to relish the history, soak in the sweeping views of the parched landscapes, spend some blissful moments and escape the humdrum of routine life. Please refer this link for more details on the fort including map. Advisable to carry your own water. You can combine this hike with other forts like Varugad, Vardhangad and Mahimangad. All four forts can be covered in 2 days. Hey can I please use the pictures in a TOI story? Credit will be given to you. Yes, you can use it with due credits. Mail me the link once article is published.